Hi, I'm Jean from Paris and really appreciate your lessons! I'm rather confused as to which scale(s) I should apply over "Sweet Home Alabama" (Chords D - C - G). According to my feeling I would use Dminor pentatonic with blues notes. What is your feeling i.e. what possibilities are there? Hey Jean, you're right the D blues scale works well. Here's a neat trick for creating a bit more variation in your solo. Play minor/major pentatonic on a D root over the D and C major chords as normal, then move to G major pentatonic over the G major chord. 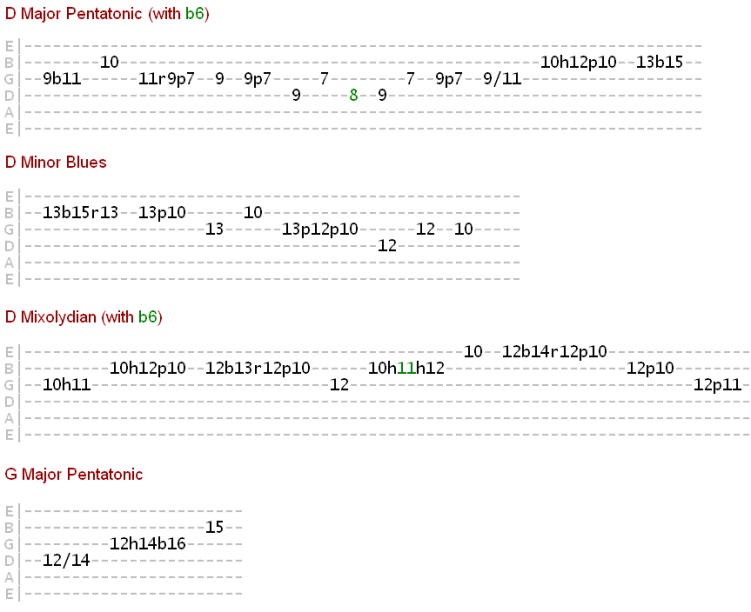 To do this, simply move the major pentatonic pattern to a G root when the chord changes to G major, e.g. the 15th fret (or 3rd fret if you want to play in the open position). As for other scales, the progression used in Sweet Home Alabama is essentially written in D Mixolydian (whether intentionally or not). How can we know this? Because it moves from the tonic or "home" major chord (D major) down a whole step to another major chord (C major). This whole step major chord relationship implies Mixolydian modality. You can learn more about identifying modal progressions in the modes section of the site. Below I've recorded an example solo which makes use of the scales mentioned above. Now, usually your solos won't be this calculated (i.e. you won't necessarily set out to cover all possible scales), but hopefully it'll show you how these scales can work over a I - bVII - IV progression. in reference to above title you mention that b6 can be played as an additional note in the normal D Major pentatonic scale. How come? I can't see how. Of course it would be great if you gave audio example licks with each scale you mentioned in order to put all this into practice and understand things better. John, the b6 functions in exactly the same way the b3 in major pentatonic and b5 in minor pentatonic - as a passing, chromatic tone. If you hold it, it'll sound dissonant, since it's not a natural part of the major key harmony, but if you play through it as part of a quick chromatic sequence, e.g. from the 5 to the 6 (and then perhaps to the 1), it'll give major pentatonic a kind of country, bluesy feel. I'll upload some example licks shortly, but from the above description, try playing the chromatic sequence of 5 - b6 - 6 - 1 over the youtube track and you'll hopefully hear what I mean. Thnaks for your precise explanation for applying the b6. I'm really looking forward to your audio lick examples, also for the other scales you recommended. John, I've added an example of how these scales can be used, including the b6. The b6 is used very subtly, but you'll notice it resolves up to the 6th in both instances. Thank you so much for your helpful examples! There's one thing which doesn't seem logical to me. If the song is clearly in the key of Gmajor why are your recommended scales mainly concentrated around D pentatonic (minor and major)? Max, there's a simple test you can do, try playing G major/minor pentatonic over the track. G minor pentatonic doesn't sound quite right to my ears, but G major pentatonic I covered as an option. If you wanted to play on the root of G, you'll want to play G major/Ionian, which is essentially the same notes as D Mixolydian. The reason I chose D as the root is because D, to me anyway, is the tonal center. There's actually a lot of debate on the net about "what key SHA is in" (apparently even the band members had that debate themselves), but we have to remember that key and tonal center are two different things. The whole D major (I bVII IV) or G major (V IV I) key thing might be subjective, but there's a strong D Mixolydian tonality to this progression that is difficult to ignore. If you listen to the live performances of SHA, there is a switch between D minor/major pentatonic and G major. But it makes more sense, in a tonal sense, to use G major pentatonic over the G major chord, whereas D major pentatonic covers the quicker changes between D and C major. Try not to tie yourself to one root scale. A much greater solo can come from connecting your scales and melody to the specific chords being played (hence the move from D major pentatonic over Dmaj to G major pentatonic over Gmaj). Thank you kindly - you have helped me tremendously. I now learned that the key and tonal center are two different things. I will need to read more about this and learn which one has prority. I guess in most songs they are identical. Key and tonal centre are indeed identical in most songs, especially if the natural major and minor key centres (Ionian, Aeolian respectively) are being used. The heated debates you'll read in numerous guitar and music theory forums regarding what key songs are in is, in my opinion, of secondary importance to, and often confused with the tonal centre of the music. Tonal centre is primarily about resolution - the feeling that a sequence of chords has returned "home" and the gravitational pull of the other chords in the sequence to that home chord. Sweet Home Alabama can, of course, be said to be in the key of G major. You could call G major the "parent scale" of that sequence of chords, since Dmaj, Cmaj and Gmaj are all part of G major harmony. But where it gets rather ambiguous and subjective is whether Gmaj or Dmaj is the "home" chord. To me, after a few times around the progression, there is a stronger pull to Dmaj as the tonal centre of the progression than the parent key centre of Gmaj. In other words, in SHA, Dmaj is not being used as a dominant (V chord) function in relation to G major, but rather the I chord of its own mode, Mixolydian. One thing that reaffirms this to my ear is in the chorus (when the lyrics "sweet home Alabama..." are sung), when the sequence goes Dmaj / Cmaj / Gmaj, but then there's a little flick back to Cmaj before going back to Dmaj. Nobody can tell me that Cmaj is really functioning as the IV chord of G major in that context! Why? Because IF you went back to Gmaj from that brief Cmaj change, it wouldn't sound like home... would it? OK, maybe I'm over analyzing it. Now, you can of course still play the G major scale, because it contains all the notes of its 5th mode D Mixolydian, but because Dmaj is the tonal centre, it's often easier to play on THAT root (D) so you can more easily see all the passing, chromatic and blue notes that gravitate around the tonal centre. That's why scales such as D minor pentatonic and its related blues scale works over ALL THREE chords and, arguably, G minor pentatonic only works over G major, and even then it sounds a bit "forced" or misplaced in relation to the rest of the progression (to my ears, again its subjective!). Now, if those same three chords in SHA were played as a 12 bar blues progression - Gmaj / Cmaj / Dmaj (I IV V) - THEN G minor pentatonic/blues would have a lot more mileage, because Dmaj falls into its natural dominant (V chord) function, resolves to Gmaj as the I chord and, as a result, the tonal centre is now firmly on G.
Honestly, this stuff will drive you crazy at first, but keep experimenting with scales on different roots and your ear will soon find its way home. Let your ear be the judge. That was very helpful indeed. This is the best format for learning soloing and Intervals I have come across. That explanation through the thread is brilliant.